When it comes to losing weight, running is the most simple and effective cardio exercise without great risks of physical injury. It enhances your heart function, metabolism, and breathing and makes you feel healthier. It can promote losing weight while preserving your muscle mass. Running target and affect large muscle groups in your arms, legs, and core. It breaks down muscles and rebuilds them stronger and slimmer than before. Running 30 minutes every day will greatly increase the number of calories and fat you burn off. To achieve a great result combine running with other aerobic and strength exercises and a low carb diet plan. 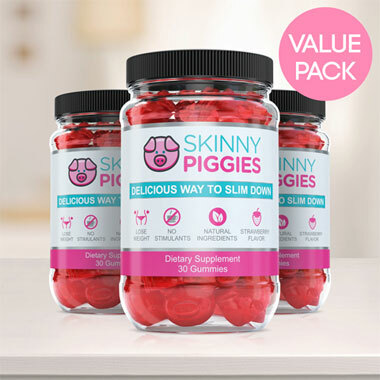 Skinny Piggies gummy supplement will help you to fight your hunger and Satisfy cravings in a healthy manner so that you consume fewer calories. You can take one gummy 30 minutes before each meal. Which Appetite Suppressant Works Best? What do Fiber Gummies Do? Are Fiber Gummies Good for You? How do Fiber Supplements Lower Cholesterol? Which Fiber Supplement Causes the Least Gas? Which Fiber Supplements Are Soluble? Fed up with boring diet regimens? Do you feel limited with your food options? You aren't alone. Let's be frank, lots of people don't enjoy diet programs. It's certainly not fun refraining from foods you love, not fun being hungry, and surely not fun trying to exercise when you'd rather collapse onto the couch with a new episode of Nurse Jackie. The good news is, there is a unique product that can help you: Skinny Piggies. What is this? Let's give you the facts you need to know first. Before we discuss Skinny Piggies slimming gummies, let's see what is required for your body to start losing weight. 3) A meal plan which is fun, so that you can stick to it for a long time. Sadly, a large number of fat loss plans skip one or more of these items. To see effective success with your diet program, it's important that you eat fewer calories than you burn off every day. You could do that in one of two ways: boost your caloric expenditure through added physical activity or lower your food consumption. Doing both is the most effective! If only fat loss was that easy! Even though cutting back on your daily calories may seem easy peasy in theory, in practice your carbohydrate cravings will probably make you pining for sweets all day long. And that's when Skinny Piggies gummy supplements can help. Skinny Piggies are fun, sweet healthy snacks you won't have to feel guilty about! Enjoy the tasty flavor of these slimming gummies and let them do their work. Ok, what exactly are these gummies doing for you? Hunger is mostly controlled in 2 ways: energy intake and the feeling of food in the stomach. After you eat, your stomach fills up and the food stretches it. This is what makes you feel satisfied and stops you from eating more. When you eat a Skinny Piggy 30 minutes ahead of your meal with an 8-ounce glass of water, it will form a gel, that activates stretch sensors in the stomach, alerting the brain you consumed a large meal. When you have later, you are already partially full and eat fewer calories. That's how you can stop desire for food and hunger, food cravings, and eat much less, without being hungry all day. When you use these great-tasting slimming gummies prior to eating, they form a gel coating around the food. That decreases the transport of the carbohydrates you ingest into the blood. This manages to keep the blood glucose a bit more normal and makes sure that you are in weight loss mode all day long. It can even make your workout sessions feel much easier. So you could be asking, what's different about Skinny Piggies compared to the other diet pills sold in stores? First, our product contains zero artificial additives. Take a look at any weight-loss supplement and you'll see a list of chemical names that you can't pronounce. Skinny Piggies contain absolutely zero artificial additives: in fact, you can read and pronounce each of the ingredients. 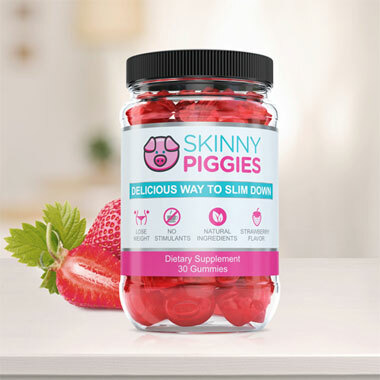 The nutrient rich, 100% natural ingredients used in Skinny Piggies also have additional healthy benefits including things like support for anti-aging benefits, healthy looking hair, and healthy looking skin. Skinny Piggies have no stimulants and no harsh chemicals. No stimulants means no running out of steam and you can use it before dinner too. No harsh chemicals means Skinny Piggies are gentle on your stomach. And lastly, what other weight loss pill is as tasty as a mouthwatering fruit flavored gummy? Losing weight is never easy, but our delicious gummies are ready to help you make the process more easy on you. You will like the flavor of these gummies so much, forgetting to eat your dietary supplement won't be a problem. 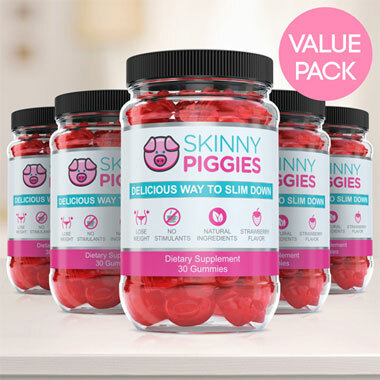 Skinny Piggies are weight loss gummies that is fun to use.